As anyone who’s ever seen a peacock or a hummingbird can attest, birds are some of this planet’s most magnificent inhabitants. Their feathers are highly specialized and often dazzling. Scientists have a good idea about the ways many of those beautiful feathers came about, but others remain a mystery. Now, at least, one feather question has been answered. In a paper published this week in the journal The Auk: Ornithological Advances, researchers explain the source of the pink-headed duck’s lovely coloring. Figuring this out was more complicated than you might think. As far as ornithologists can tell, the pink-headed duck (Rhodonessa caryophyllacea) has been extinct for decades. The last living bird was seen in India in 1949. This is a blow to biodiversity, for sure, but it also makes it pretty hard to study the species. While some museums have taxidermic specimens in their collections, they’d generally prefer that those specimens remain intact. It’s the same puzzle facing scholars of ancient manuscripts: The objects of study are both scarce and fragile. Nobody wants to destroy a manuscript or a rare specimen just to find out what makes it tick. So zoologists Daniel Thomas and Helen James got creative. They scanned a preserved pink-headed duck from the Smithsonian Institution using a technique called Raman spectroscopy. Raman spectroscopy is a pretty simple process in which scientists shine a laser on their sample and analyze the way the light scatters. The pink-headed duck gave up its secrets under laser light. The bird’s rosy head feathers were colored by carotenoids, a type of naturally occurring pigment. Carotenoids are responsible for the pink in flamingo feathers and the red of a cardinal’s wing, but such colors are nearly nonexistent in the duck family. In fact, there’s only one other pink-feathered species of waterfowl: the pink-eared duck (Malacorhynchus membranaceus). "Working with the pink-headed duck specimen was an incredible privilege," Thomas said in a press statement. 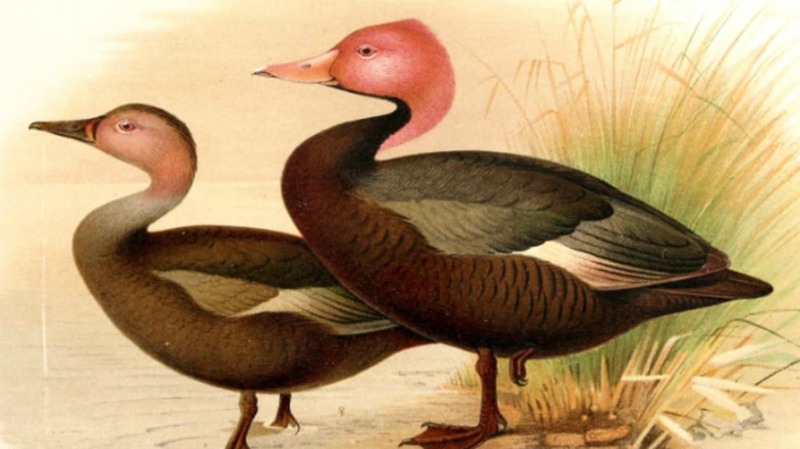 "While the extinction of the pink-headed duck has not been explicitly confirmed, it has sadly not been seen alive now for many decades. The duck specimen was a physical and somber reminder of extinction, but I was grateful that the study skin had been preserved in the collections at the Smithsonian Institution. This gave us an opportunity to make new natural history discoveries that emphasize the value of other living species."